Barley wine or Barleywine is a beer style of strong ale originating in England. The first beer to be marketed as Barley Wine was Bass No. 1 Ale, around 1900. It is called a barley wine because it can be as strong as wine; but since it is made from grain rather than fruit it is in fact a beer. 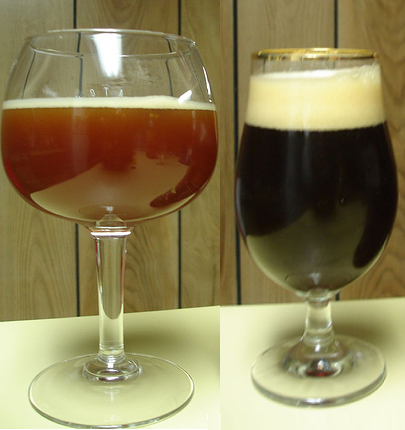 Left: Barley wines' colour ranges from a translucent deep amber, to cloudy mahogany (left), to an almost opaque black (right). A barley wine typically reaches an alcohol strength of 8 to 12% by volume and is brewed from specific gravities as high as 1.120. Most barley wines range in colour from amber to deep reddish-browns, though until the introduction of Whitbread Gold Label in the 1950s, British barley wines were always dark in colour. All are rich and full-flavored.